Feb 3, 2019 Ultra High-5 Braces Available @OzVolley These braces are designed specifically for athletes that have suffered prior ankle injuries and provide added support and reinforcement to help prevent further injury occurrences. Jan 22, 2019 New Mizuno Shoes Have Arrived! Be sure to check out the New Mizuno Wave Lightning Z5 and Mizuno Wave Momentum Indoor Court shoes that are now available to order here at OzVolley. Jan 4, 2019 Quantity Discounts Now Available Online! Quantity discounts now available online on many of our product lines! The Queensland Pirates Men's Team (2018 AVL Champions) will participate in the Asian Men's Club Championships in Taipei later this month. 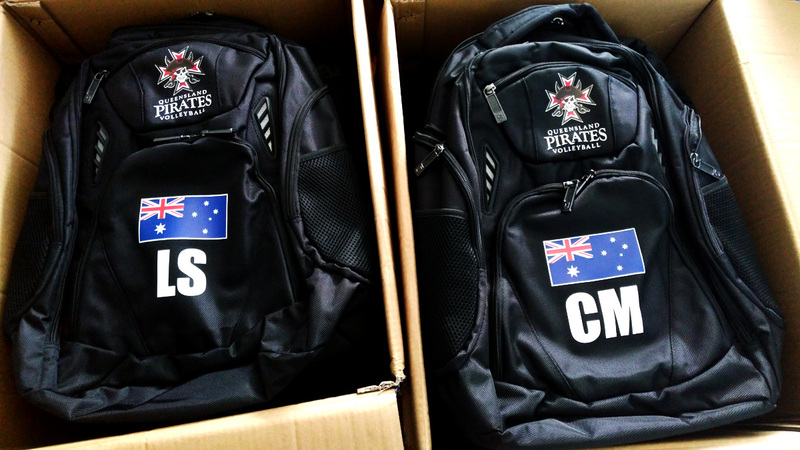 OzVolley was tasked with creating an awesome looking backpack for each of the athletes and staff travelling to compete. Here is what we have come up with. This challenging decorating task involved multiple-media applications on heat sensitive 100% nylon backpacks. We used printable nylon media for the colour applications (logo and flag) and cad-cut flex polyurethane vinyl with a nylon-suitable adhesive for the initials and logo text. Here is the result! We think it came out great. If you need custom decoration done, and you are on a tight time-frame, be sure to contact us here at OzVolley and we can help you meet your deadlines! Best of luck to the staff and athletes at the Asian Club Championships in Taipei later this month. © 2017 - 2019 OzVolley Australia. All rights reserved.